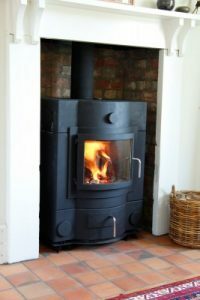 When you are connecting a wood burning stove to a chimney, it is really important to get it right. I accept that it does look awfully simple, you want a stove installation, you just close off the fireplace, poke a hole in the wall. Insert the fluepipe, seal the gaps and all is well. Building Regulations state that the flue should not be more than 1″ bigger than the stove pipe. Most chimney flues are 9″ x 9″ and stove pipes are typically 5″ – 7″. The problem here, is that even using the larger pipes of 7″ (which are fairly uncommon), then the flue shouldn’t be bigger than 8″. The only way to resolve this is to have the chimney lined. This is why, you more than likely need a liner when you have a stove installed. If your flue is only 1″ bigger than the stove pipe, then as long as it passes a flue integrity test (showing that it’s not leaking) you can, theoretically, install the stove without a liner. However, you musty make sure there is adequate sweeping access, if not it will be condemned on the first visit from a certified sweep. Finally while it is only a cosmetic thing, it is intensely irritating. Look at the point where a flue pipe enters the wall. Almost without exception, it will be surrounded by cracks and bits of plaster falling off, and just like every other area, stove installation Cambridge is littered with such examples.